Keep your vehicle safely lit with this super compact Nano Mini Light Bar. Measuring only 13.5 inches long and 2.75 inches tall, this vehicle safety light is packed with 18 high-power amber LEDs which are certified to SAE Class 1 and California Title 13 requirements. The Nano Mini Light Bar uses wide angle inner lensing to provide 360 degree visibility from the rounded, aerodynamic design. The polycarbonate dome and painted steel base provide a sturdy, weather-resistant build and the unit is mounted to a vehicle using three 90 pound magnets. 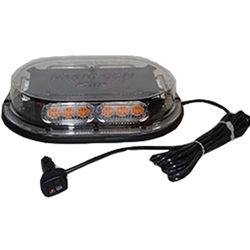 The light bar gets power through a 15 foot straight cord with a vehicle auxiliary power adapter. There are 7 user-selected flash patterns to meet whatever lighting requirements are needed. This product is made to order. Please allow 7 to 10 business days for factory assembly.